How can something this adorable produce the stinkiest gas in the world? The pediatrician informed us that one of the reasons Paolo is such a happy baby is that he doesn’t suffer from gas pain. And how did we know this? He is excellent at passing gas. A pro. (Before I had a baby, I would have thought this was too much information, but not now.) 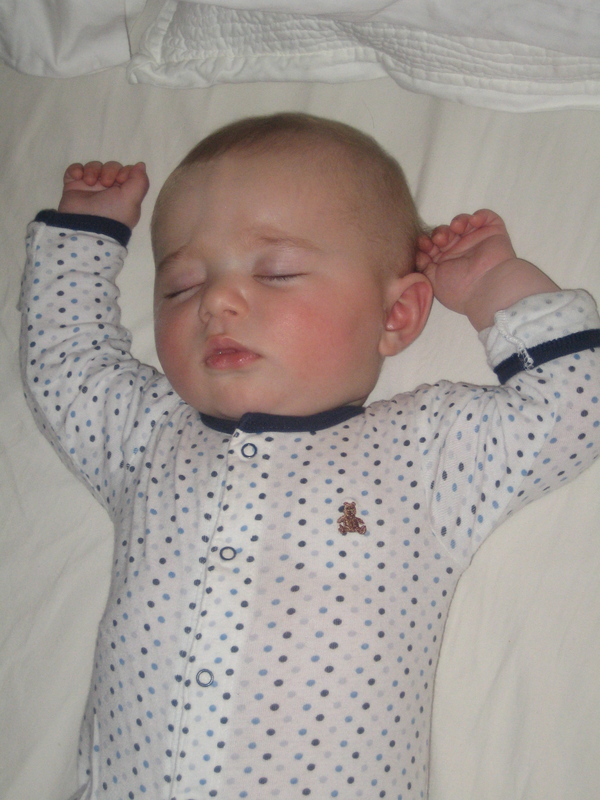 Having been exclusively breastfeed until recently, Paolo was able to free his stomach of any excess air without making a stink (literally), only some noise. Which was funny. Paolo still frees this tummy of excess air, except that now he makes a stink. An adult, make-your-eyes-water, non-baby-like stink. It is unbelievable. 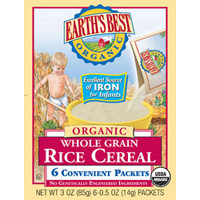 I chose all natural, whole grain, organic rice cereal as his first meal. And look where that got us. in the hopes that this would produce less potent gas. We’re still waiting to find out. All I know is, traveling with a baby that makes this caliber of stink can really get you some funny looks on an airplane. I’ve been told to just wait until he really starts eating “grown-up” food. Good gracious. We’ll need gas masks to survive. So, given this reaction (which is normal, I know) and the fact that I’m not sure he even swallowed anything, I didn’t give him more cereal for a few days. Then, he had a check-up with the pediatrician on Friday, she let us know that it was definitely time to give him solids on a regular basis. His teeth are ready to come out, he’s near sitting up by himself, and he’s getting bored with just milk. 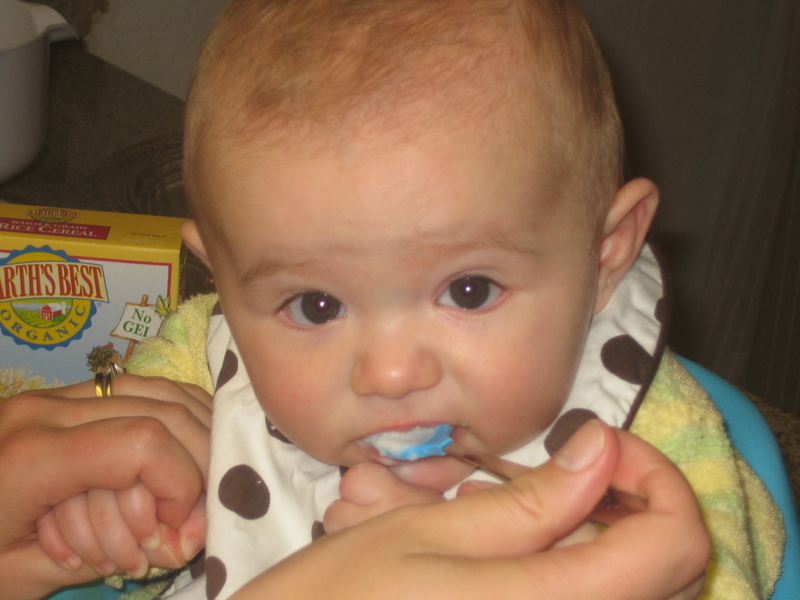 Basically, he’s ready for solids. Sniff, sniff. I didn’t realize how quickly this day would come. 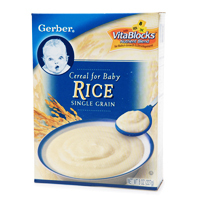 I know that he will continue to nurse and will receive his nutrients from me, but I just didn’t expect to introduce solids already. Sniff, sniff. 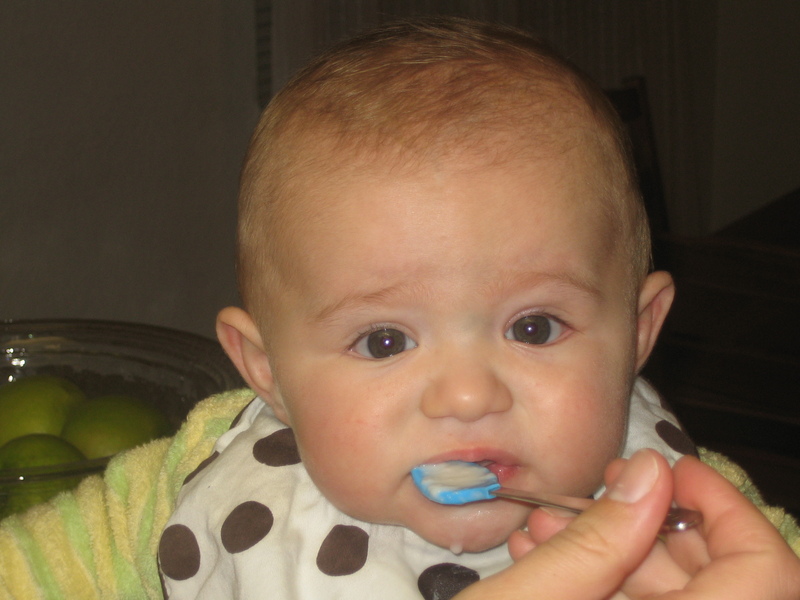 This morning we gave him another serving of rice cereal. At first, he wasn’t enjoying it one little bit. (And I was beaming on the inside.) Then, he started to like it. A lot. It took some work to get the food in, but he was really excited and loving it. 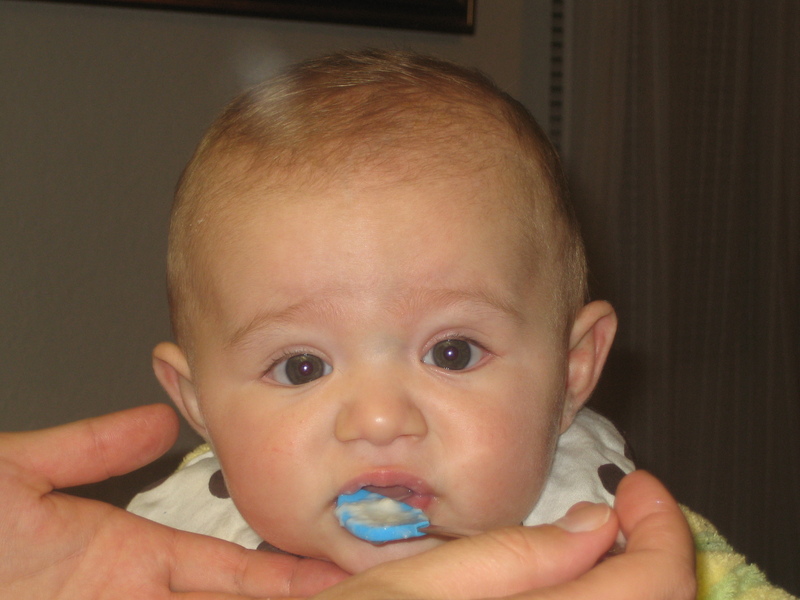 Paolo started to lean into the spoon and going for it. He finished the entire serving and was as happy as could be. Then, he had a nice long nurse (which made me happy) and then a nice long nap (which made both Giuseppe and I happy). I had planned to give him another serving this evening. His evening meal was planned for 7pm, but he started fussing at 6:30, so I nursed him a bit and then he fell right asleep. For the night. I guess he’ll get more in the morning, but I wanted him to have some cereal this evening to see if he would wake up less to eat. It’s crazy how he has started waking up so much at night, and I hope this helps to get his daytime eating schedule back on track. 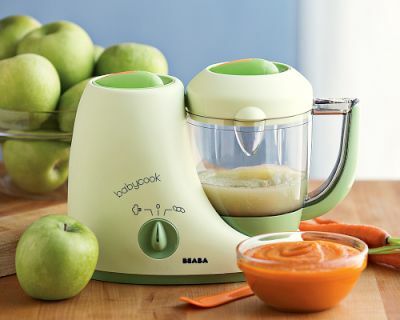 The Beaba Babycook Baby Food Maker from Williams Sonoma. A coworker raves about it, and it looks awesome. It’s “a steamer, blender, warmer and defroster in one compact appliance.” I love it. I am, I think, when he is ready, going to introduce first sweet potatoes, then avocado, then bananas. (Very slowly and one at a time, of course.) Any suggestions? This is all happening too fast for me! Solids! Wow.